The Dingos have lost their annual match in Ottawa, going down to the Swans by 54 points at the Manotick Polo Club. 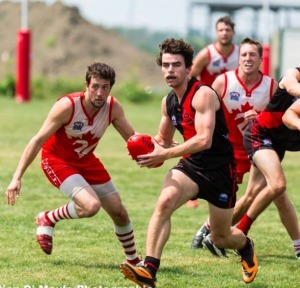 Having won the first encounter between the two teams in round one, the Dingos headed to the capital full of confidence that they could pull off another upset. After a tight first quarter that saw rookie Thomas Santibañez-Espinosa take several courageous marks and kick an important goal, the Swans held the lead by four points. The rest of the match saw the teams maintain relatively even possession, however a couple of costly 50m penalties and inaccurate goalkicking saw the Swans open up a healthy lead on the scoreboard. The midfield, led by Michael Ladd, worked hard all day to ensure that every Ottawa possession was under pressure, while forward Sean O'Reilly continually provided a target in the front half. The Dingos now sit at 3-3 at the halfway point of the season, and are on the outside of the top-5 by less than one percent. Important games against the Demons, Wildcats and Blues await as the red and black look to push for a finals berth over the next month and a half.